Our workshop leader, David Barker, has been tapping trees and making his own syrup in Louisville for years. 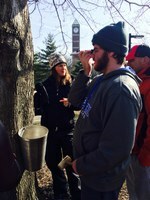 He will give a workshop on the process and then attendees will get to work with him as we install taps on our own maple trees located in the Garden Commons and around campus. RSVP and Connect on Facebook!